Definition - What does Utthita Hasta Padangusthasana mean? Utthita hasta padangusthasana is a standing asana that builds balance, improves concentration and promotes a sense of stability. The name comes from the Sanskrit utthita, meaning "stretched," hasta, meaning "hand," padangustha, meaning "big toe," and asana, meaning "pose." From tadasana (mountain pose), one knee is lifted towards the chest and the corresponding hand grabs the big toe. The leg is extended forward then moved out to the side. The other hand stays on the hip while the gaze turns to the same side. 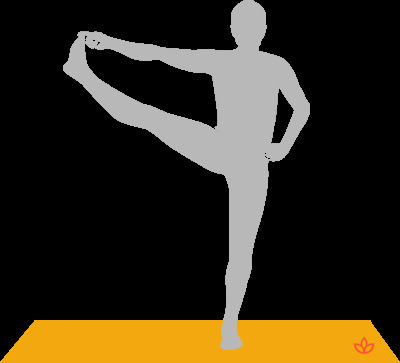 Utthita hasta padangusthasana is also referred to as extended hand-to-big-toe pose in English. Utthita hasta padangusthasana improves one's sense of physical and mental balance. It improves concentration during meditative practices, balances emotions, promotes steadiness of the mind and increases self-awareness. This pose also helps one stay connected to the foundation of ease and equanimity that is always within while deepening the strength of the core and opening the heart. Utthita hasta padangusthasana works with the svadisthana (spleen or sacral) and muladhara (root) chakras. Stimulating these two chakras helps strengthen one's sense of stability, openness to intimacy, creativity and sense of Self. For modifications, beginners may keep the knee bent and open the hip to the side or use a strap to hold on to the foot. In addition, the gaze may be kept forward until enough balance is achieved to look to the side.